SPARTAN-G059 is a Spartan-III supersoldier of Gamma Company. Following the Human-Covenant War, she participates in covert high-profile operations for the Office of Naval Intelligence with supervision by the AI construct Nyx. SPARTAN-G059 enlisted with the United Nations Space Command's SPARTAN-III program at a young age, along with other orphans, having been given an opportunity to avenge the family that was lost during the Covenant's war against humanity. Trained by Lieutenant Commander Kurt Ambrose and Senior Chief Petty Officer Franklin Mendez at Camp Currahee on the planet Onyx, she was assigned to Gamma Company. Following her augmentations in February 2551, SPARTAN-G059 and the rest of Gamma Company remained in training for over a year. The majority of the company received deployment orders away from Onyx several weeks after the Fall of Reach in August 2552, with only the three highest-ranked teams remaining on Onyx. Following the end of the Covenant War, SPARTAN-G059 served the Office of Naval Intelligence, embarking on covert high-profile operations. On January 21, 2558, ONI Section Three deployed the Spartan aboard the Winter-class prowler UNSC From the Ashes on an operation to New Llanelli in the Brunel system to assassinate Avu Med 'Telcam, leader of the Servants of the Abiding Truth. SPARTAN-G059 disembarked in the remains of a city on the planet, whereupon she snuck past Unggoy guards and eliminated two Kig-Yar scouts. Jumping onto a Phantom dropship as an impromptu means of transportation, the Spartan destroyed a Type-26 Shade and broke through a window leading to 'Telcam's position, where the Sangheili was conversing with two subordinates. After quickly eliminating the Sangheili guards, SPARTAN-G059 engaged 'Telcam himself, narrowly avoiding his carbine fire. The Spartan forced the Sangheili to take cover within a bubble shield with a fragmentation grenade, allowing her to rush 'Telcam and knock the rifle from his hands. 'Telcam slammed the Spartan into a wall, cracking her helmet, though she recovered and maneuvered around 'Telcam, eventually knocking the Sangheili to the ground. As 'Telcam picked himself up, SPARTAN-G059 finally executed the Sangheili with a single pistol shot to the head. The Spartan was quickly extracted by From the Ashes, which entered slipspace upon leaving the planet. She was then assigned a new operation. SPARTAN-G059 wears green Semi-Powered Infiltration armor outfitted with thrusters. During the mission to assassinate Avu Med 'Telcam, she wielded two M6H magnums, as well as several M9 fragmentation grenades. 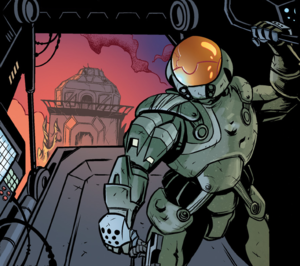 SPARTAN-G059 is the protagonist of "Knight Takes Bishop", the penultimate story of the comic anthology Halo: Tales from Slipspace. Although she is not identified as such, the manner of her deployment suggests G059 is a LONEWOLF Headhunter. S-G059 bursts in on 'Telcam and another Sangheili. G059 runs a Sangheili through with his own sword. 'Telcam and Spartan-G059 face each other down. G059 fires a pair of M6H magnums.